Rafael Nadal in familiar pose after defeating Roger Federer to remain unbeaten on his favored clay-courts this season. (CNN) -- Rafael Nadal proved once again that he will be the man to beat in the French Open later this month after brushing aside world number one Roger Federer in straight sets in the final of the Madrid Masters on Sunday. Nadal, who will reclaim second place in the world rankings from Novak Djokovic next week, is now out on his own with 18 career Masters victories after sealing a 6-2 7-6 victory over the defending Roland Garros champion. The top two players in the world had not faced each other for a full 12 months since last year's Madrid final, which Federer won. However, there never looked any liklihood of history repeating itself this time around as Nadal became the first man in history to win three clay-court titles in a year prior to the French Open, following his recent successes in both Monte Carlo and Rome. "Winning here at home is a dream," said Nadal after the match. "Never in my wildest dreams did I imagine I would win all three of these big events." Nadal is unbeaten on clay this season, with 15 successive victories, and his final victory means he now has 39 career titles to his name. Federer was warm in his praise of Nadal, but insisted he remained confident about retaining his Roland Garros title. "I feel I'm really ready for Paris now. I felt a major improvement in my game compared to last week when I came here from Estoril," said the Swiss. "It's been a wonderful event for me. 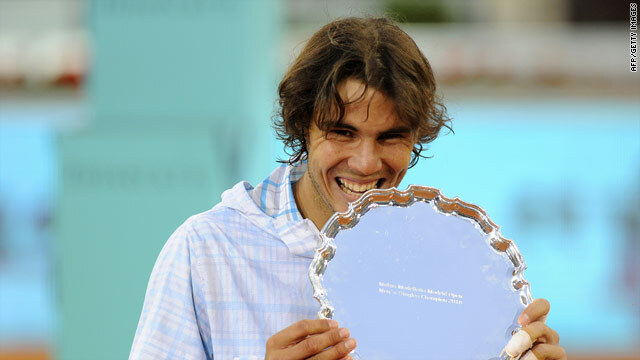 I'm sorry I couldn't defend my title but Rafa's had an incredible clay-court season, he was just supreme today."